Samsung has dominated the cheap touchscreen phone market thanks to the Samsung Tocco Lite and the Samsung Omnia2 as well as the Samsung i900 is doing quite well in the high end smartphone department. Now it's time that they try to dominate the mid-range touchscreen phone market as well. Nokia already has some pretty solid mid-range handsets such as the Nokia 5530 and the Nokia 5800 so Maybe the Samsung OmniaLite will be a best seller too? Let's find out. The Samsung B7300 Omnia Lite took its design cues from the Samsung Tocco Ultra Touch. Both mobile phones have a slim form factor although the former is a tad taller because of its 3.0 inch display. Although design-wise the Samsung Tocco Ultra Touch and the Samsung OmniaLite shares the same look, apparently, Samsung decided to scrimp on the materials used on the OmniaLite. While I like the Tocco Ultra Touch's brushed metal-lilke finish, it can't be found on the OmniaLite. In fact, the plastic lining looks cheap and the plastic cap on the USB connector looks flimsy. It reminds me of cheap China-made toys. Aside from the cheap plastic lining, there's not much to complain about the build quality of the Samsung OmniaLite. 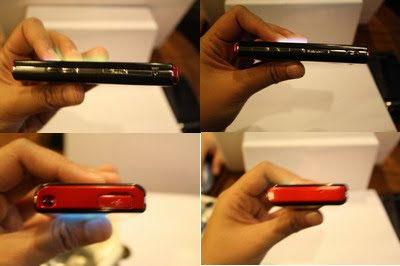 The MicroUSB port is located at the top on the left side is the volume rocker, and another menu button, on the right side you have the lock button, microSD slot, and the dedicated camera button. The B7300 will probably ship with Windows Mobile 6.5 as my unit is equipped with that OS. The Omnia Lite still has Samsung's TouchWiz Interface which is very similar to the Samsung Omnia 2. It also has three homescreens and has that animated task switcher which reminds me of the Xperia X1 panels. Like the Omnia 2, the Omnia Lite is heavily customized and you have to turn off the TouchWiz interface to get access to some of the familiar windows Mobile screens and menus. 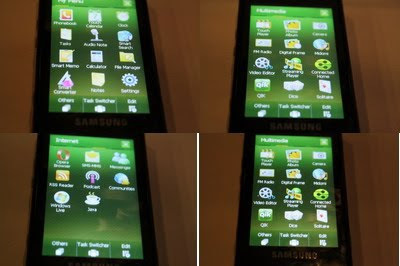 Unlike the Omnia 2, the Samsung B7300 Omnia Lite doesn’t have that cube interface so the dedicated cube button is replaced with a menu button access your personalized menu screen. The QWERTY keyboard is now similar to the Touch Diamond2 wherein the keys are assigned an letter and a symbol/number. Although the screen is smallish, I didn’t have problems with the QWERTY keyboard and thankfully, I didn’t press any buttons twice or anything. Now unlike the Samsung Omnia 2 which didn’t offer threaded messaging, the Samsung B7300 Omnia Lite does have threaded messaging. The messages are couched in speech balloons, similar to the iPhone. Also, like with the iPhone, you can type your messages in a smallish rectangular box at the bottom of the threaded message. Samsung’s phonebook is pretty basic and has thumbnail images for your contacts. You can browse through your contacts using the scroll bar on the right. For web browsing you’re given the choice between the reliable Opera browser or the new Internet Explorer that comes with Windows Mobile 6.5 Opera browser offers a much faster browsing experience and renders pages relatively quick. While Internet Explorer is a bit slow, it offers flash support so you can watch YouTube videos directly from the browser. Internet Explorer also became much more finger friendly, offering five large, circular icons so you can go back to previous pages, and to bookmarks, zoom, bring out the options menu, or bring out the keyboard. The Samsung B7300 OmniaLite supports direct DivX playback and it also supports XviD/MP4/H.263/H.264/WMV9 video file formats. Watching videos on the Omnia Lite is okay although the screen is a bit smallish. Audio quality using the speakers is passable and good using Bluetooth stereo streaming. The Windows Media player didn’t undergo any major updates though and I still find myself using Samsung Touch Player more. There’s a built in stereo FM radio too. Applications include a dedicated Facebook app, Smart Converter, Smart Memo, Smart Search (similar to the iPhone’s search function), a Digital Frame application (turn your mobile phone into a digital picture frame), video editor, Java application, RSS readers, etc. The OmniaLite also has a built-in GPS though I wasn’t able to test that since I don’t have any third party GPS applications. If you fancy a smartphone but don’t want to spend that much on the iPhone 3G or Omnia 2, then the Samsung B7300 Omnia Lite may be the perfect phone for you. You can have all the features of a smartphone in a very affordable handset. Sure, the camera might not appeal to some but all the features of the iPhone 3G (minus the apps) can be found on the OmniaLite. Hopefully, Windows Marketplace or Samsung’s own App Store would add more applications in the near future for the Omnia Lite. Love my OmniaLite but I'm waiting for the B7610 and when that comes, this one will go to my GF. For whoever reviewed this...Does the Omnia Lite have a landscape keyboard for text message input? I'm quite confused because other sites say it does, while others say it doesn't...Would appreciate an answer. Thanks! it has a landscape keyboard for texting yes. i love this phone but i cant find how to view my memory card. i have had 2 off these phones now, soon to be 3 they have all broken after a week or so and i don't agree that they are a good phone. When my phone rings the speakers wearnt loud enough for me to hear it say if i had the tv on....not worth the hassel of going back to the shop to change it!!!! Have you tried updating the Market application? Maybe that should solve the problem. "While Internet Explorer is a bit slow, it offers flash support so you can watch YouTube videos directly from the browser. "